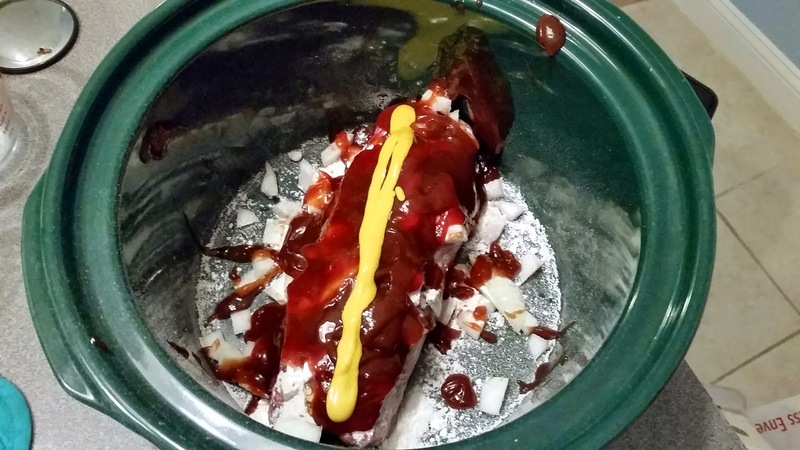 Ben's Journal: Wait, There are other ways to cook ribs? My Mom carefully split a package of ribs she had picked up from the Kosher butcher between my Brother and I (can't show favoritism, can she?). They'd been sitting in our freezer waiting for a special occasion when I decided, what the heck, I should just enjoy them! (That's what Mom would want anyway, right?). So I took them out to thaw, figuring that would force me to take action. We always make ribs on the grill, so I assumed that's how I'd do it this time as well. But, then my culinary imagination gets going and I started thinking about other options. Invariably when this happens I end up Googling "Cook X in a crockpot." And of course, you can cook ribs in a slow cooker. Some recipes called for prep work (like boiling the ribs ahead of time - yeah, not going to happen). 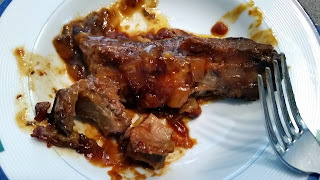 In the end, I went with the simplest option I could find: Slow Cookier BBQ Short Ribs by none other than Kraft. 7 hours later I had one heck of a lunch waiting for me! Tender ribs that took zero effort and no supervision? I'm sold! I love re-discovering the crockpot. Now for the next couple of weeks Shira has endure all manner of culinary experiments. Next up: scrambled eggs!